The first documented writings in the US about shipping crates is in a 1930 handbook (Technical Bulletin No. 171) written by C. A. Plaskett for the US Department of Agriculture although his writing imply that crates were defined before that time. C. A. Plaskett was known for his extensive testing and defining of various components of transport packaging. Although the definition of a wooden crate as compared to a wooden box is clear, construction of the two often results in a container that is not clearly a crate or a box. Both wooden crates and wooden boxes are constructed to contain unique items, the design of either a crate or box may use principles from both. In this case, the container will typically be defined by how the edges and corners of the container are constructed. If the sheathing (either plywood or lumber) can be removed, and a framed structure will remain standing, the container would likely be termed a crate. If removal of the sheathing results in no way of fastening the lumber around the edges of the container, the container would likely be termed a wooden box. Crates can be made of wood, plastic, metal or other materials. The term ‘crate’ often implies a large and/or strong container. Most plastic crates are smaller and are more commonly called a case or container. Metal is rarely used because of its weight. When metal is used, a crate is often constructed as an ‘open crate’ and may be termed a ‘cage’. Although a crate may be made of any material, for these reasons, the term ‘crate’ used alone often implies one constructed of wood. There are many variations of wooden crate designs. By far the most common are ‘closed’, ‘open’ and ‘framed’. 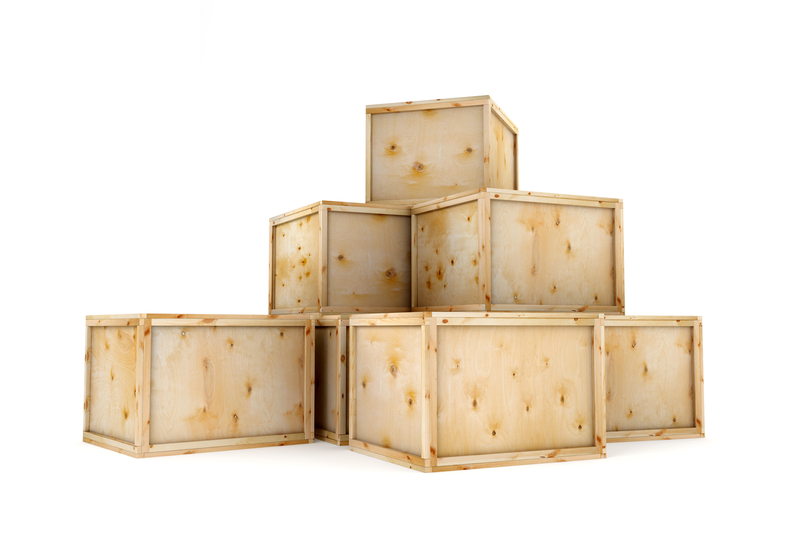 A Closed Crate is one that is completely or nearly completely enclosed with material such as plywood or lumber boards. When lumber is used, gaps are often left between the boards to allow for expansion. An Open Crate is one that (typically) uses lumber for sheathing. The sheathing is typically gapped by at various distances. There is no strict definition of an open crate as compared to a closed crate. Typically when the gap between boards is greater than the distance required for expansion, the crate would be considered an open crate. The gap between boards would typically not be greater than the width of the sheathing boards. When the gap is larger, the boards are often considered ‘cleats’ rather than sheathing thus rendering the crate unsheathed. An unsheathed crate is a frame crate. A Frame Crate is one that only contains a skeletal structure and no material is added for surface or pilferage protection. Typically an open crate will be constructed of 12 pieces of lumber, each along an outer edge of the content and more lumber placed diagonally to avoid distortion from torque. When any type crate reaches a certain size, more boards may be added. These boards are often called Cleats. A cleat is used to provide support to a panel when that panel has reached a size that is may require added support based on the method of transportation. Cleats may be placed anywhere between the edges of a given panel. On crates, cleat placement is often determined by the width of the plywood used on plywood sheathed crates. On other crates, cleats are often evenly spaced as required to strengthen the panel. Sometimes two cleats are added across the top panel of a crate placed as needed to give the top of the crate added strength where lifting chains or straps may press on the crate while lifting. Cleats may have more specific names based on added benefit they provide. Some published standards only use those more descriptive terms and may never refer to these various lumber components as cleats. For example, lumber placed under the top of a wood container to add support for a large top are called “joists”. Lumber is built into the mid-section of the top of a wood container to strengthen the top are called “cleats”. When the cleats are enlarged and constructed to support a large top, they may generically be termed “cleats” or more specifically be termed “joists”. “Skids” or thick bottom runners, are sometimes specified to allow forklift trucks access for lifting. result in different stresses from shock and vibration. Differences in pressure, temperature and humidity may not only adversely affect the content of the crate, but also will have an effect on the holding strength of the fasteners (mostly the nails and staples) in the crate. agencies and documents. This is the result of the small size of the industry and the fact that a single, finite definition of an item that is different every time it is made can be difficult to define. IATA, the International Air Transport Association, for example, doesn’t allow crates on airplanes because it defines a crate as an open transport container. Although a crate can be of the Open or Framed variety, having no sheathing, a Closed crate is not open and is equally as safe to ship in as a wooden box, which is allowed by IATA. In general conversation, the term crate is often used to denote wooden boxes and crates simply to shorten the term however in commercial use; the misuse of the term could result in a container that is not suitable for its intended use. Ship Care Packages to your College Bound Kids!